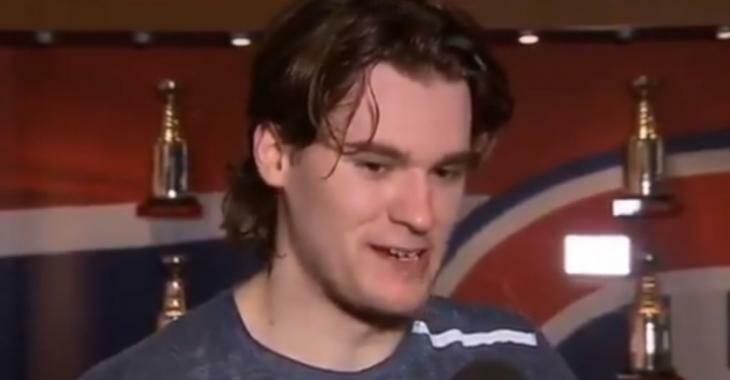 NHL News : Habs' Drouin gave us the best NHL soundbite of the year when talking about the Senators! Habs' Drouin gave us the best NHL soundbite of the year when talking about the Senators! Drouin absolutely destroys the Sens ahead of tonight’s divisional showdown. The Ottawa Senators have been quite dysfunctional since last season and we all know how it turned out: the team traded forward Mike Hoffman this summer after teammate Erik Karlsson’s wife accused Hoffman’s girlfriend of cyberbullying. The it was Karlsson's turn to be traded to the San Jose Sharks in September for a disappointing package of prospects and picks. We all remember GM Pierre Dorion struggling to find something positive to say about his club ahead of the 2018-19, managing to say "We're a team" as a consolation comment, and of course, the whole saga with players trashing coaches in a video recorded by an Uber driver. And do we have to talk about owner Eugene Melnyk's failed attempt at a new downtown arena and now suing a partner, adding to the controversy continuously taking place between the Senators and the city? You are not the only one paying attention to the madness: Montreal Canadiens forward Jonathan Drouin has been following the mess in Ottawa and provided the NHL fanbase with the greatest soundbite of the year during an interview with TSN's John Lu as the Habs were facing the Sens, in a game they won by the final score of 5-2. This is quite the slip-up by Drouin, but probably something the whole Canadiens dressing room had been joking about since the ongoing problems started taking place in Ottawa. While it is a slip-up from Drouin, we can't argue that it's not true. Or hilarious! In the contest, Drouin registered a goal and two assists, working the line with teammate Max Domi, but he also manage to give us one of the best soundbites in a while!